Stay informed with what's new – legal info, events and help in B.C. The Indigenous Law Research Unit (ILRU), housed in UVic’s Faculty of Law, is the only research unit dedicated to the restatement and revitalization of Indigenous law in Canada. ILRU partners with Indigenous communities, at their request, to articulate their own legal principles and processes, on their own terms, in order to effectively respond to today’s complex challenges. ILRU also works to deepen broader engagement with Indigenous law through the delivery of workshops and development of academic and public legal education resources. 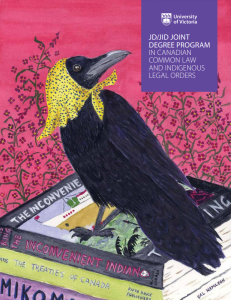 As a recent graduate from UVic law and now master’s student, this work is significant to me because all of ILRU’s works starts from the position that Indigenous laws are real, are alive, and are capable of being known and publicly applied. Although it is hard to imagine for some, it was not that long ago that Indigenous people could not even hire a lawyer let alone research and promulgate their own laws and traditions. ILRU has helped stoke the fires of the legal traditions it has worked with since it emerged in 2012 from a national partnership with the Truth and Reconciliation Commission of Canada (TRC) and the Indigenous Bar Association. The first ILRU project had a significant impact on the TRC’s Calls to Action and was so ground-breaking that Indigenous communities began to contact the ILRU directly to request partnerships to research their own laws. Since that time, ILRU has partnered with Indigenous communities on a wide breadth of legal issues and questions. Currently, ILRU is engaged in nine projects ranging from creating Indigenous law curriculum for use in law schools to work that is aimed at examining the principles and processes in an Anishinaabe legal tradition that relate to community governance. The JID/JD dual degree is truly groundbreaking. Similar to the position taken by ILRU, the program begins from the understanding that Indigenous laws are real, knowable, and can be critically examined and worked with by both insiders and outsiders. This program is a double degree that will, throughout the four-year program, instruct students on the complete content of a Canadian common law degree and aspects of various Indigenous legal traditions for the purpose of increasing the students’ capacity to work with and within these legal traditions. One of the most exciting components about the JID/JD program is the field course that students will undertake during their third and fourth years and comprise the entirety of their course load during the semester. During these terms students will, under the close supervision of academic supervisors and community knowledge keepers, learn about a particular Indigenous community’s legal traditions by observing the ways in which their legal processes are applied today. The field schools will also have students work with the specific community on law-related projects. The purpose of these terms is to imbue students with the skills necessary to understand the institutions, sources of law, forms of reasoning, legal principles and procedures within those People’s law(s). The first field course, “C?ELA?N?ENE? *: A Field Course in the Re-emergence of W?SA?NEC? Law Fall 2018” will be offered in Fall 2018 and taught by John Borrows and Rob Clifford. The significance of having the focus of the first field course be W?SA?NEC? law merits specific mention here. The work of reconciliation and revitalization is something that falls on the shoulders of every Canadian citizen and institution. Often times the work can seem overwhelming, too abstract, or any other myriad of sensations as it asks Canadians to grapple with hard truths about our past and present. I ask readers to draw inspiration from what is being undertaken at University of Victoria when dealing with such struggles and look to those closest to you. I am grateful to be a part of an institution that, while understanding the need to be attentive to national and global issues, begins by working with those who have and continue to be directly impacted by the University’s physical presence upon their territories. *Words may not render properly in RSS and WordPress. Please see the link for the correct rendering. This paper provides a discussion on Indigenous Law. This video is a presentation on the issue of Indigenous traditions of regulation and governance and how those relate to settler legal institutions. This collection of short educational videos provides critically oriented introductions to important topics in the area of Indigenous law. This revised flowchart provides a step-by-step overview of the Aboriginal child protection process and the rights of Aboriginal children and families. All ten fact sheets in the series have been revised and updated. They are now available online as a single combined version. The fact sheets provide information on what abuse is, how people can plan for their safety and protect their children, and who can help. The revised and updated English booklet explains the basics of family law in BC. All chapters have been recently reviewed and updated by a team of reviewers and contributors, all volunteers from the BC legal profession. This guide provides first steps to address over 40 common legal problems and information on where to get help. Published on Clicklaw Wikibooks, it is available in multiple media formats: wikibook, EPUB (for reading on a tablet or e-reader), PDF (print version), and printed books (will be available soon at public libraries across BC). This online tutorial helps you learn about Canada’s Registered Disability Savings Plan. You can navigate through the chapters at your own pace or go directly to a specific question from the list on the homepage. This resource has a list of picklists, which are lists of standardized terms for court orders. They are stored in courtroom computers so a Court Clerk can use them to quickly and accurately capture the order a judge makes. When a judge decides to change the standard wording, a Court Clerk can edit the term accordingly. This website is part of a project that aims to disseminate human rights information that is accurate, accessible, and relevant to the safety and well-being of trans and gender-diverse individuals and their supportive allies across British Columbia. In this new report, BCCLA proposes a model for providing independent oversight and accountability to Canada Border Services Agency (CBSA). It also includes detailed recommendations on the components necessary to ensure effective, credible oversight and review of CBSA’s activities. How can I get access to my personal information from public or private bodies? How can I request information that doesn’t fall under “personal information”? I didn’t get the records I was looking for from a public body. What can I do now? Who can handle FOI/ATI requests? What are the costs? My medical records have been mishandled. Who do I contact? Updated common question: Is marijuana legal in BC?